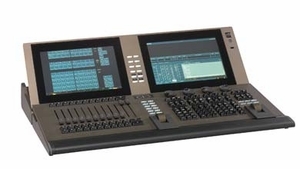 ETC Gio Lighting Control Console - 4,096 or 24,576 outputs with no co-processing. The power of an Eos lighting system but in a smaller package, sized just right for your budget, space or tour. Gio includes two integral, articulating multi-touch displays and supports up to three external displays, all of which can also be multitouch. The back-lit keypad’s layout is virtually identical to Eos. If you know Eos – the industry standard in lighting control - you’ll know (and love) Gio. Gio can integrate into an Eos Ti, Eos, Gio @5 or Ion system with ease, acting as a primary, back-up, or client console in combination with the rest of the family. All of the accessories available for Eos and Ion service Gio as well. Ships With: Gio consoles ship with a dust cover, three active Display Port to DVI adapters, mouse, backlit alpha-numeric keyboard, power cord, and two LED Littlites.